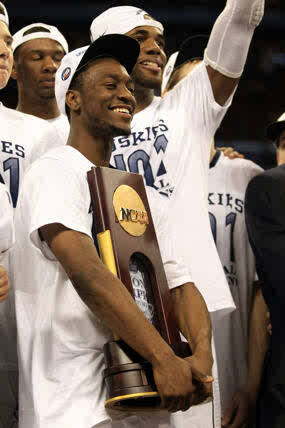 Kemba Walker and UConn’s Shining Moment! Kemba Walker’s magical journey is complete and the Connecticut Huskies are to 2011 Men’s Basketball National Champions! In what may go down as the worst National Championship game ever, the UConn Huskies defeated the Butler Bulldogs 53-41. UConn used a 22-3 run to cease control in the second half. Kemba Walker led UConn with 16 points, and Jeremy Lamb added 12 points. Shelvin Mack was the only Butler player to reach double digits in scoring with 13 points. Kemba Walker was named the Final Four’s Most Outstanding Player. The championship is UConn’s third, all under coach Jim Calhoun. Calhoun now becomes the fifth coach to win three National Championships. What is most impressive about UConn’s run is that this was their 10th consecutive victory. They won five games in five nights to win the Big East Tournament, and then won the last six to win the National Championships. This will go down as the greatest post-season run in college basketball history. 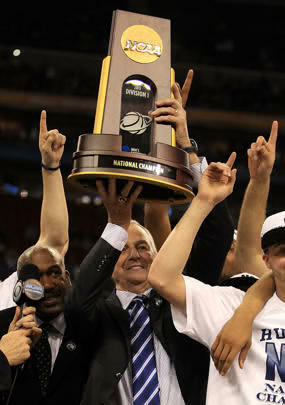 For Butler it was their second consecutive year losing in the National Championship. Butler shot a title game worst 18%. Kemba’s journey is complete and he will go down as one of the best college basketball players in NCAA history. On May 8th Kemba will graduate in only 3 years. May 8th is also his birthday, as well as Mother’s Day. This is Kemba’s World and were living in it…but you already know that! Previous Previous post: Almost Complete! Next Next post: Time to Panic?